Yesterday, the Oregonian's Brad Schmidt reported that substantial portions of Ted Wheeler's plan on affordable housing [cached] were lifted verbatim (or with minor edits) from Jules Bailey's plan. 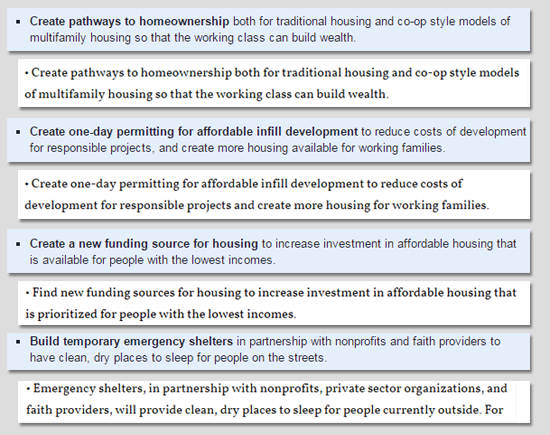 Portland mayoral candidate Ted Wheeler's new plan to tackle homelessness includes two statements plagiarized from his rival, Jules Bailey, plus two other phrases with very similar language. Already, Wheeler's campaign has edited the language published on the site. In the interest of a record for history, I've captured the relevant portions. The blue sections are from Bailey; the white sections are from Wheeler. To Team Wheeler's credit, his team took responsibility for lifting the language. But after reviewing the statements, Cox took responsibility and said he "made a grave error" in the editing process and unknowingly used Bailey's words. "This was an editing error," Cox said. "We have begun taking steps to correct it. We apologize." To me, though, this betrays an important thing: The Wheeler policy document on one of the most important issues facing Portland was shopped out to his campaign staff and consultants. Certainly, professional writing and editing help is perfectly reasonable -- but this episode demonstrates that they're not even Wheeler's ideas in the first place. As the guy whose company built Jules Bailey's website, I can report: Jules wrote his own policy plan. They're his ideas, through and through. And now we know: Even Ted Wheeler thinks they're great ideas.